Find out how to have an affordable, low maintenance fiberglass pool installed in your backyard this summer. Get away from it all in your own backyard this summer. Your new fiberglass pool can be installed quickly. Since Swim Shack fiberglass pools are prefabricated, after excavation the entire pool is set in place by a crane. You really can have a custom inground swimming pool this summer. We are moving into the busy season. 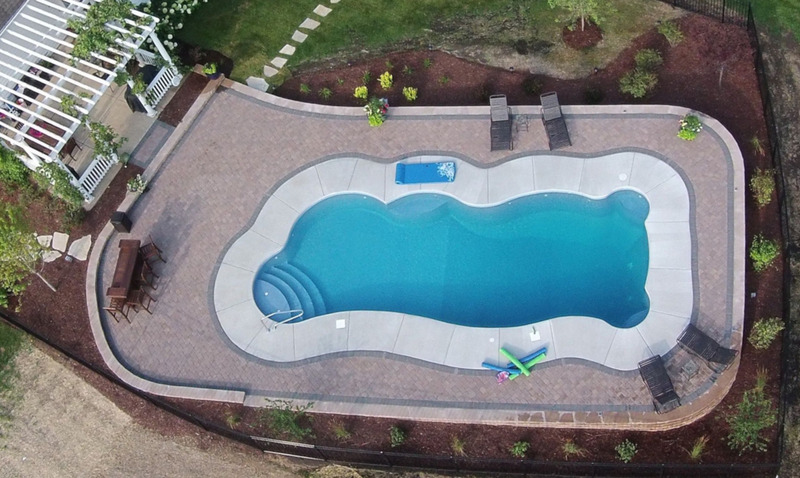 If you are thinking about a custom inground pool, now is the time to Call Swim Shack at (630) 466-4853. Fiberglass is a flexible composite material which is 17 times stronger than concrete, yet it can withstand up to 12 inches of deflection. This means your fiberglass swimming pool can withstand our northern Illinois winter freezing and thawing and our hot Chicago summers. It is the same resin and material used to build fiberglass underground storage tanks. Fiberglass pools never have to be resurfaced. Many people spend just 30 minutes a week taking care of their fiberglass in ground swimming pool. The durable surface of a fiberglass pool does not affect the pool water pH level like the plaster on a concrete pool, reducing your chemical costs and re-circulation needs. Fiberglass pool surfaces do not absorb algae, reducing cleaning costs compared to a concrete pool which can absorb algae. Your fiberglass pool is like your bath tub. Any accumulation of algae, suntan lotion or body oils can be swept away with a brush or wipe them with a gentle cleanser. You want to swim in your pool instead of spending your time maintaining your pool. Fiberglass pools never have to be plastered or painted like a concrete pool. The total maintenance is lower than that of a concrete or gunite swimming pool. Your fiberglass pool will have a smooth, satin finish. Walking and seating areas are textured for slip resistance. The fiberglass in ground pool featured above is surrounded by a decorative concrete deck. Swim Shack can offer you a variety of colors for your custom inground fiberglass pool. Choose from a variety of brilliant colors. Whether you are drawn to the Caribbean blue or the lighter hues of the Pacific. 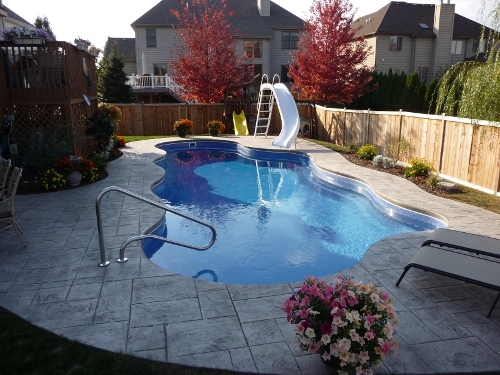 Swim Shack can put you in the custom swimming pool of your choice in your own backyard. Call Swim Shack Inc. your quality pool builder of fiberglass swimming pools to find out how to have an affordable fiberglass swimming pool in you backyard this summer. We are located in Sugar Grove, Illinois, just west of Aurora in the far western suburbs of Chicago. Call Swim Shack at (630) 466-4853.